Look, it’s that time of year and I really felt like it needed to be said. It may be an unpopular opinion, but it’s my opinion. I like pumpkin pie as much as the next person, and I can enjoy pumpkin (strictly in the months of October and November) in a variety of forms: soup, pie, perhaps in a savory dish like ravioli. I even enjoyed the unusual mashup of the Danish kringle with pumpkin yesterday. But, I have to draw the line. I don’t need my tea to taste like pumpkin spice, or my Oreos. Pumpkin spice, I believe, goes with actual pumpkin. Anyway, I’m trying to get into the Halloween spirit. I need to find someone who wants to watch all the scary movies that have come out recently: The Babadook, Good Night, Mommy, The Visit. (No spoilers!) And The Man has acquired a pumpkin, which he promises to turn into a pie. Typically, I do the cooking around here, but I don’t have a lot of patience for fidgety things like pie crust, especially since I like mine gluten-free, which makes them twice as tricky. But the man is good at measuring things in a way that I am not. In fact, in his day job, he is a metrologist: a measurer of very, very small distances for very, very precise purposes. So he makes the crust. And since he’s making the crust, he can make the rest of it too while he’s at it. So, while it seems obvious that the world disagrees with me on this, given the proliferation of weird pumpkin spice flavored things this season, and the fact that every year there are more of them in stores, I like to make a distinction. Pumpkin spice is for pumpkins, and you’ll never change my mind. 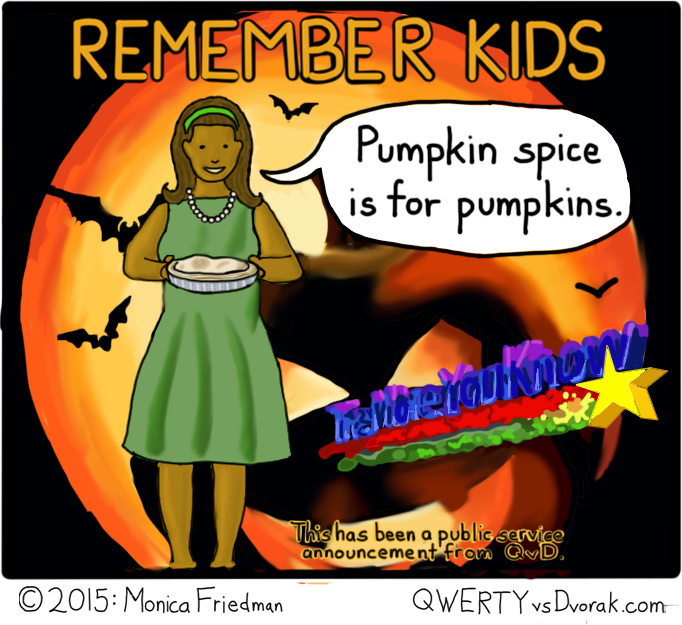 This entry was posted in webcomic and tagged bats, halloween, pie, psa, pumpkin, the more you know, webcomic on October 2, 2015 by littledragonblue. I agree with you – the orange Oreos are revolting! The town i was raised in is home to the plant that can’s 75% of the pumpkin on store shelves, which ment that the first two days of autumn the town smells like pumpkin, the rest smells like compost. It also ment we had an annual “pumpkin festival”, which was like any small town harvest festival except that it has an abundance of pumpkin products. every year they (disappointingly) try to out do the previous year in terms of “weird food that shouldn’t have pumpkin but now does” so I have sampled way more then my fair share of pumpkin flavored products. ; while I do have a weakness for pumpkin spice, 99% of the stuff that is made is terrible! I am also curious to hear what you think of “Goodnight Mommy”, I was really excited about it… until I saw it a few weeks ago. I was disappointed but friends of mine loved it. I still haven’t seen Goodnight, Mommy. No one wants to watch scary movies with me anymore, and somehow I no longer enjoy watching them alone…. The last horror movie I saw was The Babadook, and everyone in our group enjoyed it. It’s pretty cerebral for a horror film. Sorry about your pumpkin-flavored hometown. I lived downwind of the Sara Lee factory, so every day I’d be standing on the corner, before the sun was up, freezing my but off waiting for the bus, and smelling pound cake.